Oh my, what a story of good and evil, love, soul-searching, and coming of age. It's a unique premise, very detailed, very complex. To think that you get another chance at life, but it's based on an eternity changing choice you'll make in the first one. To essentially be free to make that choice, but both sides (and sometimes your parents) are doing everything they can--and then some--to tip the scales. I have to admit, I loved the story. The entire book (read it on Kindle, but it's like 400+ pages in print) is about Ten not being able to choose a side, or a boy. I sped through some sections because, I get it, she can't choose. Sure the story elements kept me involved, but it just kept circling back to her not being able to choose. That aside. The action draws you in. The fight scenes are a bit gory, and the love triangle is predictable. But there are some serious twists in the family story that surprise. I'm looking forward to the next installment in the series. There are some holes to this story, leaving me as a reader wanting some answers and clarification. **This book will be available for purchase February 23, 2016. 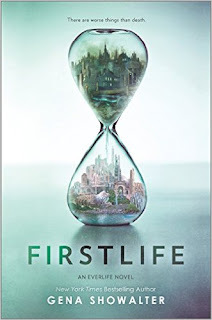 Disclosure of Material Connection: I received this ebook galley from Harlequin TEEN through the netGalley publisher/reader connection program. I was not required to write a positive review. The opinions I have expressed are my own.